Our activities focus on markets to which we bring value by developing innovative and competitive solutions that help our customers respond to the constantly evolving challenges faced by the planet and its people. We tailor high value-added solutions to the current demands of end users and anticipate their future needs. 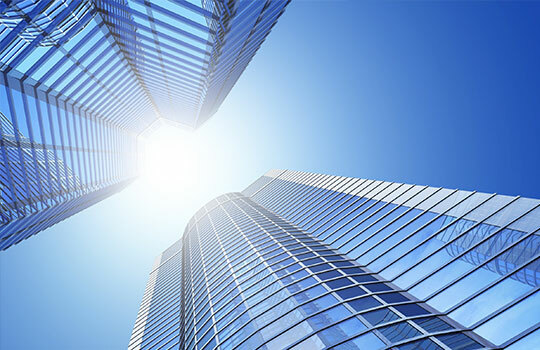 On the basis of our core technologies, expertise, and skills we have developed solid positions on seven distinct markets with high growth potential: consumer goods and healthcare, automotive and aerospace, resources and environment, agro, feed and food, electrical and electronics, building and construction, and industrial applications. In all the main value-added businesses in our portfolio, we work ever more closely with our customers on each market, learning about their businesses and their ecosystems. 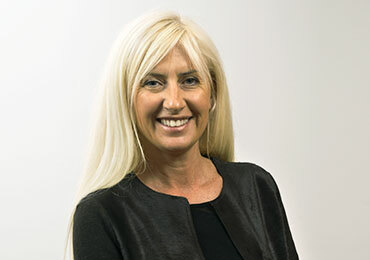 With the knowledge and understanding that come from such close collaboration, we are in an excellent position to innovate alongside our customers. 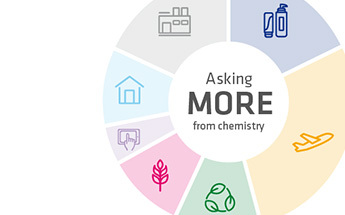 Anticipating their needs, we can devise new chemical solutions that, in turn, further stimulate our customers’ product development and help them create more value. Over the past few years, our top customers have significantly changed, and now include some of the world’s leading players in aircraft, automotive, tires, smart devices and consumer goods – who we provide with unique solutions that are critical for the success of their programs. 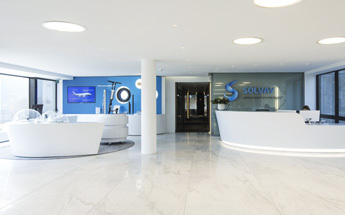 Solvay has become a unique supplier of product material formulations, key to the performance of its customers. 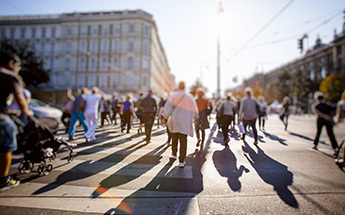 Consumer behavior is changing as populations in mature economies are growing older and the middle classes in Africa, Asia and Latin America are increasing. Consumers … want easy-to-use and multifunctional solutions that are tailor-made, safe and sustainable… and that contribute to their health and well-being. From smart textiles to personal care, our broad portfolio offers innovative, sustainable and competitive solutions. We are constantly improving the performance of our products by combining innovation and sustainability, as we have done with EURECO® organic peroxide for detergents and the global license agreement on encapsulation technology recently signed with Revolymer. We offer a unique range of thermoplastics for implantable and non-implantable medical devices. Our portfolio of advanced medical-grade polymers includes RADEL® PPSU, which has excellent impact strength, and VERADEL® HC PESU, which is resistant to high temperatures. We are also active in the pharmaceuticals sector: our BICAR® sodium bicarbonate is widely used for effervescent tablets. Manufacturers have to comply with ever more stringent regulations on CO2 and particulate emissions while meeting consumer demand for safer and more environmentally … sustainable travel. Our solutions contribute to cleaner, safer and more energy-efficient modes of transportation. We are an integrated player with a comprehensive portfolio of lightweight materials that make vehicles and aircraft more fuel-efficient and cost-effective. These range from high-performance polymers to long-fiber compounds, tapes, foams and the most advanced composite solutions for semi-structural and structural applications. For the automotive industry, they include SOLVALITE™ thermoset composites and EVOLITE™ thermoplastic composites, which enable short cycle times and superior toughness. Among Solvay’s aerospace solutions is TEGRACORE™, a structural foam with excellent resistance to fire and water. Our polymers and fluorinated products provide effective thermal control solutions, optimized acoustic systems and corrosion protection for automobile powertrains. NOCOLOK® Flux, a high-quality fluxing agent used for brazing aluminum components, is an industry standard for aluminum heat exchangers. The future of electromobility depends on batteries with higher energy density, greater power and lower cost. Solvay develops solutions that meet the highest requirements in terms of safety and of temperature and chemical resistance. They address the needs of the entire battery system, with a specific focus on a new generation of electrolyte additives, salts, binders and separators improve lithium-ion battery performance. 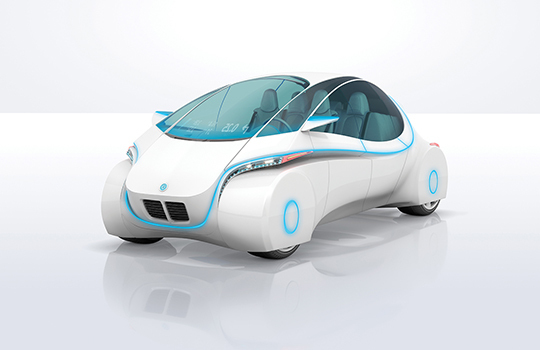 Our SOLEF® PVDF electrode binders offer enhanced adhesion and cohesion properties required for high-energy electric vehicle drives. Meanwhile, our TECHNYL® engineering plastics have now expanded with TECHNYL® REDx, a specialty polymer developed to resist the higher continuous heat stress of new-generation engines. Premium SW, our range of Highly Dispersible Silica (HDS), helps reduce the rolling resistance of tires, thereby lowering both fuel consumption and CO2 emissions. OPTALYS®, one of our rare earth catalytic materials, reduces emissions of NOx and other gaseous pollutants. It can be customized to exactly meet customer specifications. Solvay’s sustainable solutions for the oil and gas, mining, and energy generation and storage sectors help its customers offer their own consumers … energy-efficient and environmentally-friendly products and services. We supply products tailored to the specific needs of all the key phases in the oil and gas value chain: exploration, production, stimulation, transport and refining. SOLEF® PVDF is used to manufacture pipelines that resist corrosion and high temperatures, and avoid leakage. Our solutions for oil extraction include additives like natural guar derivatives and surfactants that increase yields and limit the environmental impact of drilling. We are a leading supplier of specialty mining reagents, which enable customers in the mining industry to improve productivity and reduce operating costs for the recovery of many metals and minerals, especially copper, alumina, gold, silver, uranium, nickel/cobalt and polymetallic ores. Our INTEROX® hydrogen peroxide both enhances the recovery of metals and detoxifies water elements after metal extraction. Our solutions are used in the production and storage of renewable energies and to improve energy efficiency. 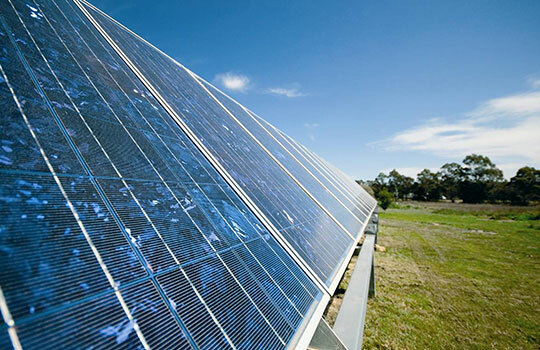 HALAR® ECTFE brings highperformance and UV protection to photovoltaic panels. Our LiTFSI lithium salt makes Li-Ion batteries last up to 20% longer while improving safety and performance. We were a partner in the recently concluded LIFE+ GLEE project, which focused on replacing organic solvents with water in the Li-Ion battery manufacturing process. Our solutions support air and water treatment and soil remediation using filtration, gas separation, absorption, and chemical reactions. Both UDEL® PSU and ALGOFLON® PTFE ensure better water filtration in membrane processes, while INTEROX® hydrogen peroxide is widely used in drinking water treatment. SOLVAIR® Solutions are a range of products and systems for air emission control and associated waste management that meet the demands of waste-to-energy incineration, industrial boilers, cement manufacturing, etc. The growing global population requires greater agricultural yields and better resource management. 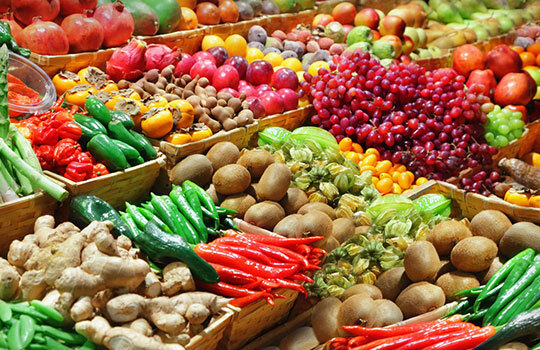 Solvay’s unique portfolio of innovative solutions supports customers … from farmers to food processors, helping them operate responsibly and sustainably. Our eco-efficient bio-polymers and RHODIASOLV® POLARCLEAN solvents improve crop protection and yields. Our AGRHO™ solutions, which promote water and nutrient retention in plants, enable our customers to reduce the use of resources and environmental impact. PROCROP™ is an effective and sustainable alternative to conventional pesticides in grain silos. Our silica and sodium bicarbonate-based solutions meet the quality, food safety and productivity requirements of this market. A feed supplement for livestock, BICAR® Z sodium bicarbonate, helps fight acidosis and thus contributes to animal health. Our PARAMOVE® solution is a hydrogen peroxide-based solution for the fish farming industry that controls sea lice in salmon. With more than 130 years of expertise in producing vanilla aroma, we recently introduced two new natural VANIFOLIA™ flavor brands and broadened our GOVANIL® range in order to help reduce sugar and fat content in food products. We also produce numerous products with applications in the food packaging sector, including SOLVERA® PFPE, a fluorinated fluid used as surface treatment for oil- and grease-resistant packaging. We work closely with manufacturers of electrical and electronic equipment, to ensure that our miniaturization technology and advanced materials are fully geared to … their needs and provide them with new perspectives in terms of design, safety and energy performance. Our strong and rigid KALIX® HPPA polyamides are used to manufacture slim and stylish smart phones. Our polyamide solutions allow electrical equipment to offer higher temperature resistance, more efficient fire protection and user safety. Our specialty polyamide AMODEL® PPA offers particularly good resistance to continuous heat, and can replace metals in high-temperature automotive applications. For low-energy lighting solutions, we provide materials for LED lighting applications. Energy-saving light bulbs using LUMINOSTAR® product range consume up to seven times less energy than incandescent bulbs. With increasingly small device geometries, the need for advanced cleaning solutions to manufacture the future generation of semiconductors is growing very significantly. Our INTEROX® PICO hydrogen peroxide is the reference for semiconductor manufacturers. Demand is growing for longer-lasting buildings that reduce energy consumption and enhance their users’ well-being. Our solutions focus on meeting the ever more stringent … certification systems that measure environmental performance in passive residential and commercial buildings. Our solutions are used in foam wall insulation for low-energy housing. POLIDAN® PEX offers excellent heat and hydrolysis resistance and is a polyethylene particularly suitable for cable insulation and sheathing. SODA SOLVAY® soda ash, which acts as a fluxing agent for glass, is used in the manufacture of high-performance energy-saving triple-glazed windows. We provide materials that give buildings greater safety and longevity through increased resistance to fire, corrosion and UVs. These include a wide range of VOC1-free and APE2-free additives in our RHODOLINE® products, which also provide exceptional color strength for industrial coatings and architectural paints. Meanwhile, our CYASORB CYNERGY SOLUTIONS® stabilizer provides construction OEMs with a UV-resistant polyolefin suitable for roofing components. 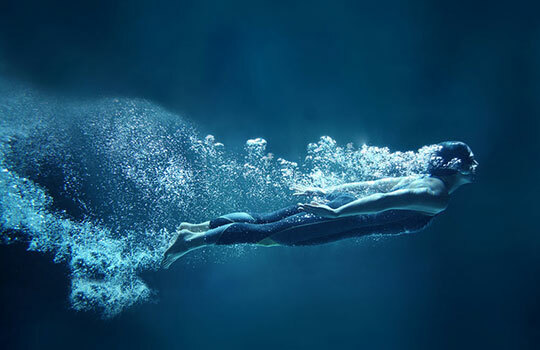 Our high-performance plastics ensure the robustness of water supply systems and drinking water quality. Our bio-sourced TECHNYL eXten® range of materials for plumbing applications was recently awarded full drinking water contact approvals in the U.S., the UK, France and Germany. Solvay is one of the few material suppliers worldwide to offer full European and American certification. 1 VOC: Volatile Organic Compounds. 2 APE: Alkyl Phenol Ethoxylates. Striving to comply with ever stricter regulations, industrial players seek to introduce bold innovations that make their production more efficient and their products more … competitive. 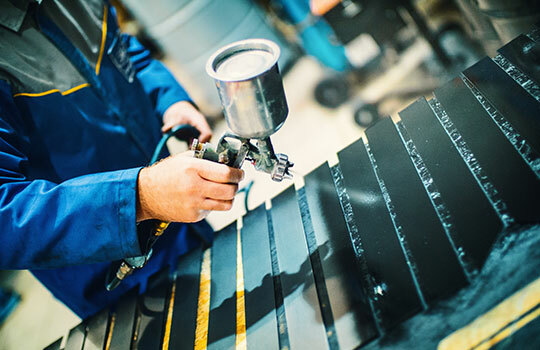 We develop materials and processes that help manufacturers get more out of their equipment in a more responsible way. We offer a wide range of binders, solvents, pigments and additives. Our eco-friendly RHODIASOLV® IRIS biodegradable solvent is used in industrial cleaning, resin clean-up, foundry resins, paint stripping, paints and coatings. We offer 3D printing polymers like SINTERLINE® TECHNYL® for prototyping, widely used in the aerospace and automotive industries. This range was recently strengthened to accommodate a predictive simulation platform. Our solutions improve the performance of finished products. The RHODOCLEAN® formulation for industrial cleaning and the bio-based AUGEO® SL191 solvent for leather processing exemplify our environmentally responsible solutions. Our ranges of SOLEF® fluoropolymers and TECHNYL® high-performance polyamides offer superior resistance to corrosion, high temperatures and chemical aggression.